When it comes to your board, there are plenty of considerations to make to ensure that you get the ride quality you demand, and the capabilities you need. The deck style, length and width are all crucial concerns. The wheels are important, too. 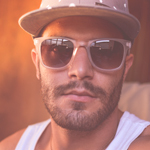 However, one of the more important elements to getting the customized ride you want is your choice in trucks. Trucks do more than just anchor the wheels to the underside of the deck. They’re an essential part of overall performance and ride quality. Not sure which ones are worth your time? 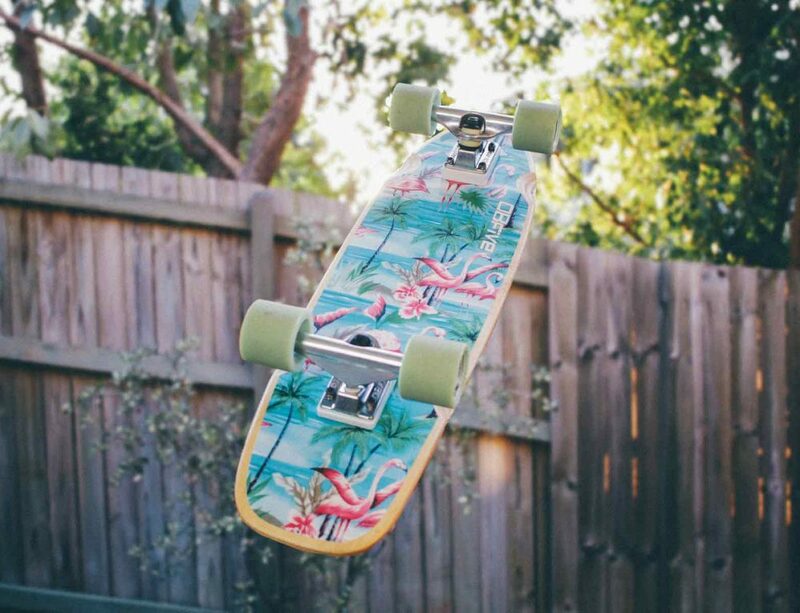 We’ve compiled a list of the best skateboard trucks and followed that up with a review of each model to help you make your decision. Now that you’ve had a chance to do a quick head to head comparison, we’ll take the discussion in another direction and provide an overview of each of the skateboard trucks on our list above. Designed and manufactured by one of the top names in the industry, the Independent skateboard trucks offer excellent performance and good looks. These trucks feature an aluminum baseplate to reduce weight while providing a stable mount, combined with a steel axle for durability and performance. 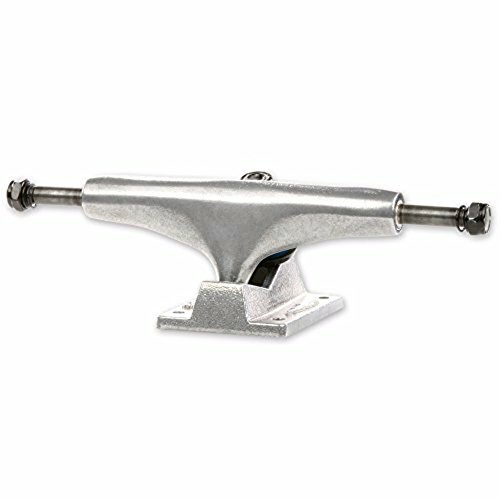 The trucks are raw silver, meaning they have more of a matte finish than a polished finish, and the Independent logo is embossed on the baseplate. 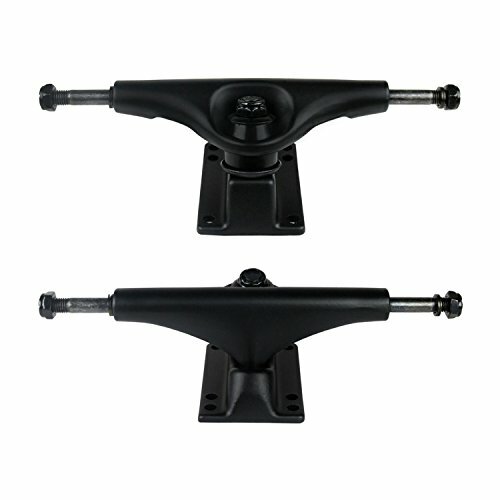 Note that these skateboard trucks are sold in a set of two, but the mounting hardware is sold separately. Note that these skateboard trucks do not come with bearings, although they do come with bushings. Ideally suited for 7.75-inch boards, these trucks can also work on other styles, including cutouts, pintails, and longboards, although risers may be necessary for some styles. Most users report that turning is smooth and their boards feel more agile with these trucks. Highly polished, these skateboard trucks are made by Team. They feature a cast steel base and a steel axle for stability and performance. Note that these are sold in sets of two only, and they do not include bearings. Mounting hardware is also sold separately. These are high trucks, so they are better suited for board setups where increased side-to-side motion is necessary. They are not well suited for riders who prefer lower board setups. 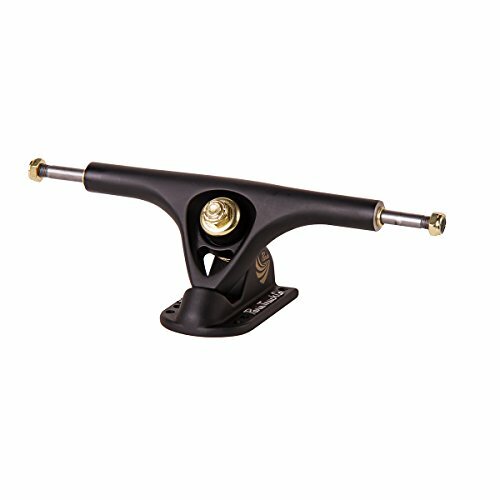 Most people who upgrade to these trucks find that their turning is dramatically improved, particularly during tricks. 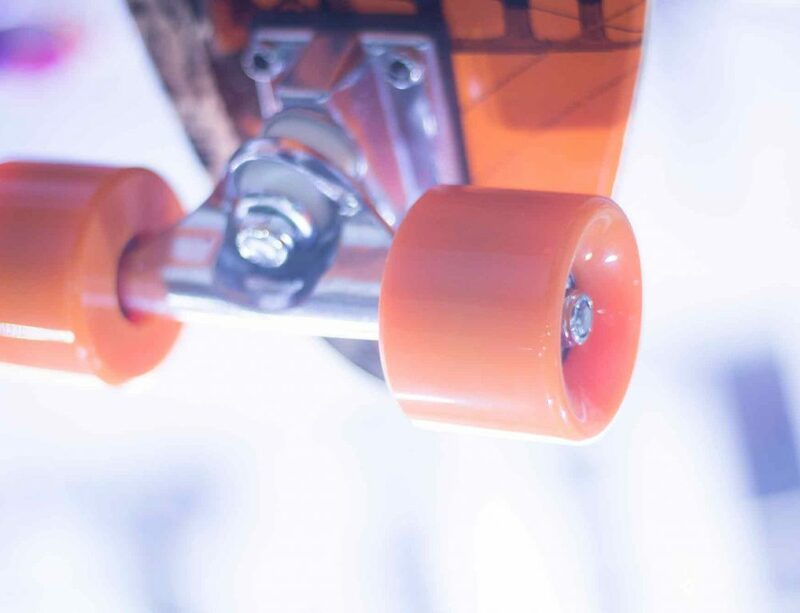 They are not well suited for longboards or straight cruising, but can be an excellent addition to other setups, particularly for those where a medium bushing hardness is important. The trucks also hold up well to hard landings. The Caliber Trucks Cal II RKP Longboard Trucks are designed for, you guessed it, longboards. They are not suited for other types, but can work very well with pintail, cutout and similar style decks of the appropriate length. These trucks offer excellent all-around performance, from carving to stability. The trucks themselves feature a high-gloss black paint designed to help provide less wind resistance than with powder coating. These trucks are sold as a set of two, and they do include the bushings, but not bearings. The solid steel construction and precision engineering help ensure a long-lasting solution for your board. Note that these are the second generation Cal design, and feature a no-slip bushing seat, and ultra-HR bushings (89A). The overall strength of the metal has also been upgraded, offering an increase of 40% over the original design. Designed and manufactured by Yocaher, these longboard skateboard trucks come with everything you need to get riding. You’ll find wheels, mounting hardware, bushings, base plates, axles, and more. The wheels offer a hardness of 78A, and the trucks are made from heavy duty aluminum alloy for extra durability and reliable performance. Unlike many of the other sets on our list, these come with black-coated mounting hardware to save you time and money. 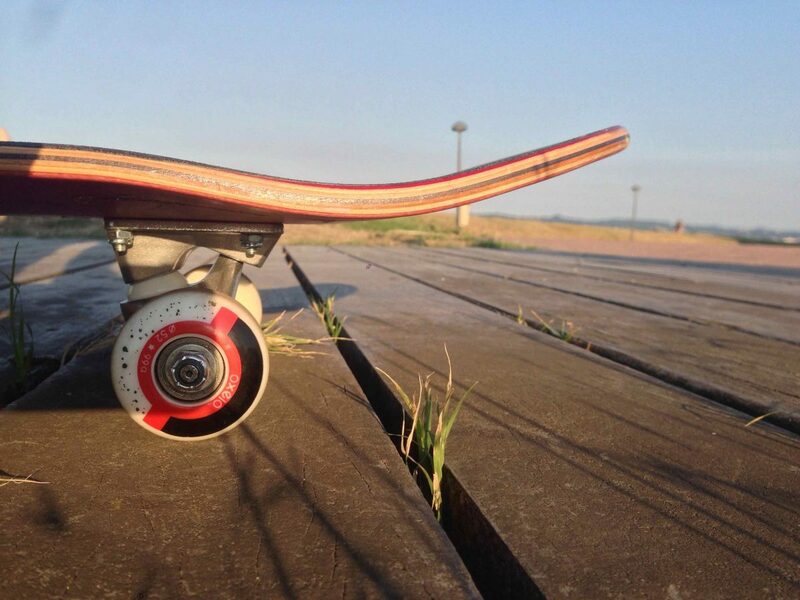 You’ll even have risers available to you if you need to add a bit more distance between the bottom of the deck and the top of the wheels to prevent wheel bite. Risers are also useful for reducing the strain on your deck from truck/deck contact. The bearings included are Ritalin Abec 5 chrome bearings that have already been lubricated with synthetic oil. Looking for a set of low skateboard trucks for your board? These Venture polished low skateboard trucks might be exactly what you need. They are sold in sets of two, and measure 5.25 inches in width. Highly polished and featuring the brand’s iconic V logo picked out in red, these trucks come with bushings but no bearings. The translucent red bushings match the logo, as well. They are manufactured from cast alloy for better strength and durability and feature a high-carbon steel axle. The overall design allows these skateboard trucks to deliver outstanding carving capabilities with less weight. While these are good options for excellent turning capability, they are even better suited for grinding due to their strength and lightweight construction. 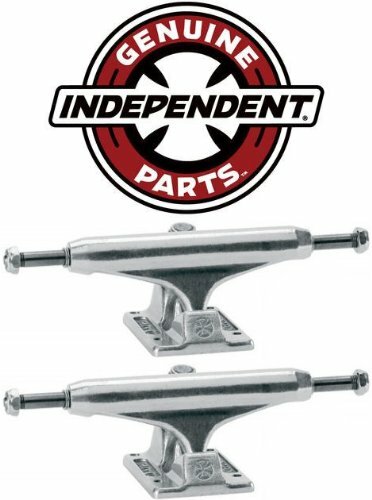 Another entry from Independent, these trucks offer the bold design and durability that you crave. Sold only as a set of two, these skateboard trucks are matte black, with the Independent iron cross logo picked out in black and white on the center of the truck, and embossed on the base plate, as well. 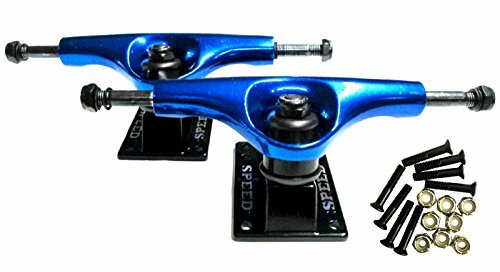 These skateboard trucks are made from solid cast metal alloy with a steel axle for strength. They come with bushings, but not with bearings. Bushings are white, and tie into the overall aesthetic of the brand’s logo. Mounting hardware is also sold separately. The wider width of these trucks is ideal for anyone who wants more stability for their riding, whether you’re cruising or pulling tricks. Slimmer than the Independent skateboard trucks mentioned above, the Bear Grizzly 852 skateboard trucks still manage to provide all the durability and strength that you need. With a width of 181 millimeters, you’ll find plenty of stability, and the semi-gloss black finish is a nice addition to your board’s aesthetic. The trucks feature full steel alloy construction with a silver steel axle. The Bear logo is picked out in white on the truck itself. The bushings are an eye-catching venom green. 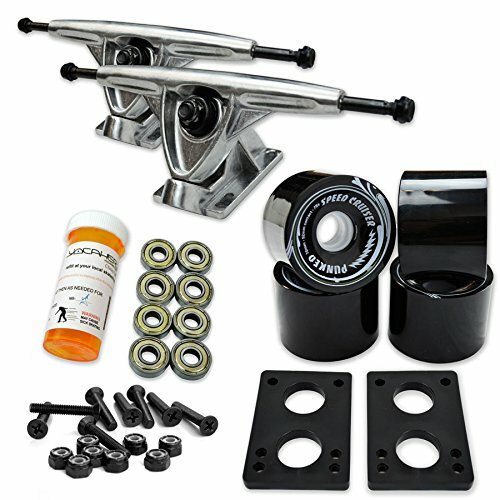 Note that these trucks are sold in sets of two, and while they include bushings, they do not include bearings or mounting hardware, so you’ll need to purchase those separately. Note that you can also choose between a 52 and a 40-degree base plate to better fit your riding needs and style. The 52-degree plate is better suited for downhill runs, while the 40-degree plate is best for general carving. In need of a strong, durable, but lightweight skateboard truck? Enter the Paris V2. It features a 50-degree baseplate, which is excellent for downhill use, but the width (180 mm) makes this set of trucks a great choice for those who want to enjoy outstanding carving. The entire truck is made from high-grade aluminum that is heat treated to provide even more strength and durability. The axle is high-grade steel for peace of mind and performance. 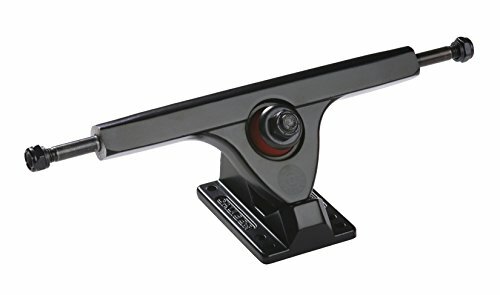 Note that these skateboard trucks come with red bushings (for a bit of color under your ride), but they do not come with bearings. The Paris logo is picked out in white on the side of the base plate mount, as well as spelled out on the base plate itself. Note that these trucks feature a six-hole mounting design so they can mount to any board, universally. Finally, Paris offers a lifetime guarantee on their skateboard trucks. If you’re in the market for a set of skateboard trucks that will help you get up to speed fast, then this set from Speed is the best bet. Featuring a full five-inch hanger, with an axle width of 7.63 inches, they are great fits for boards anywhere between 7.5 and 7.75 inches in width. They also manage to blur the line between high and low trucks – they actually come in somewhere in the middle (mid-profile). Unlike many other sets we’ve mentioned on our list, these actually come with the mounting hardware that you’ll need to put your new trucks to use. They are made from high-quality steel, and ship with black bushings. They do not include bearings, though. The Speed logo is picked out on each side of the base plate in silver to match the high-carbon axle. Note that because these are mid-rise, you may need to purchase a set of risers to prevent wheel bite, depending on the diameter of your wheels. Risers are sold separately. These Havoc skateboard trucks live up to their name – they’re designed to provide the strength and performance that you demand, and to look good doing it. Unlike the other skateboard trucks we’ve discussed, these come in a range of colors, from silver to blue, green, red, black, and white. With an axle that measures 8.25 inches from end to end, these trucks are excellent fits for boards ranging from 7.8 inches in width all the way up to those measuring 8.4 inches. The bushings provided are soft, which means that they are excellent for carving. However, you may want to order a harder set if you prefer a different style of riding. Depending on the wheel diameter in question, you may also want to order a set of risers to prevent wheel bite. Another addition to our list from Venture, the Salt N Pepper skateboard truck lives up to its name. The hanger is painted black, and the base plate is white. A white V is picked out on the hanger itself, and the name Venture is spelled out on the base plate. The axle remains unpainted steel. These trucks measure 5.25 inches, which makes them a perfect fit for 8-inch decks and are sold in sets of two only. You’ll find these trucks come with decently hard bushings (midrange – not too hard, but not soft, either). Note that these trucks do not come with mounting hardware, nor do they come with bushings. Depending on your chosen wheel size, you may need to purchase risers, as well, as these are relatively low trucks. Now that we’ve concluded our review, it’s time to go over a few important things to consider when shopping around for skateboard trucks. In most cases, that’s all you’ll get, but double check that you’re getting at least those components. Profile, or height, is important for your ride quality. Boards can be set up as low profile, mid-profile, and high profile. The trucks you buy need to match that set up. If your board will have smaller wheels, low profile trucks are best. If you’re building a cruiser, you might be best with mid-height trucks. For boards with larger wheels, high profile trucks are needed (think street boards and longboards). Spacers can help you use a specific truck with wheels that would not otherwise work, though. Finally, you should make sure that the skateboard trucks you’re buying are designed for your board’s width. Generally, you can take the width of the truck and add between .25 and .50 inches to get the minimum width of the board they will work with. For instance, an 8-inch truck would work with an 8 to 8.5-inch board. However, this is not always the case. The best rule of thumb is to choose a truck that’s .25 inches wider or narrower than your board. With the selection of trucks we’ve outlined above, you should have no trouble finding a set to match your preferred riding style, board type and width, and budget.